You can use approach described in the article How to handle improper parameter values in ASP.NET in C# to create a blocking engine to handle and improve parameter values. You should manage invalid requests and notify the client about any invalid parameters that were passed in. 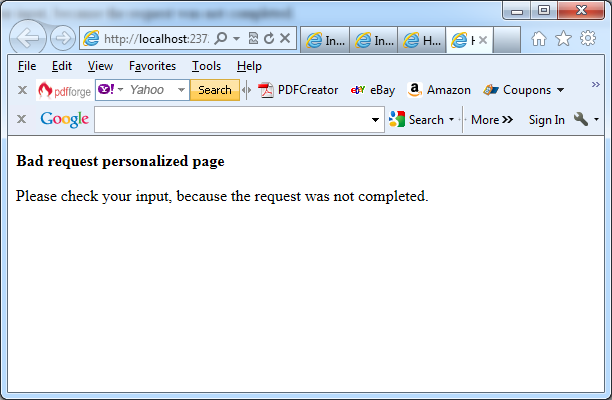 You should reply to the request using one of the specific error codes, when someone sends an invalid parameter. You leverage HTTP status codes to maintain compatibility with intelligent clients and to enable forensic log analysis if you need it. Following this approach you can deal with search engines spiders. 400 Bad request: Used to notify the browser that the request isn’t considered valid. 404 Not found: The requested content isn’t available. 500 Error: The request caused an error. Every request could, in fact, be logged (via IIS) in the corresponding log files and you can use a free tool named Microsoft’s LogParser to analyze Microsoft’s IIS log files. This tool uses a special version of a SQL dialect to submit queries against log files, retrieve the corresponding results, and put those results into different destinations, such as CSV files or a database. – You’re notifying the client that there is a problem with the request. – Your application is string the details in its log files and you can automate collecting and block unwanted IP addresses from doing additional requests if they exceed your threshold.